On Saturday we woke up to amazing sunshine and perfect temperatures. Clouds began to gather around 1:00pm and we had a minute of panic, but after a ten minute sprinkling we were back to sunshine and happiness. 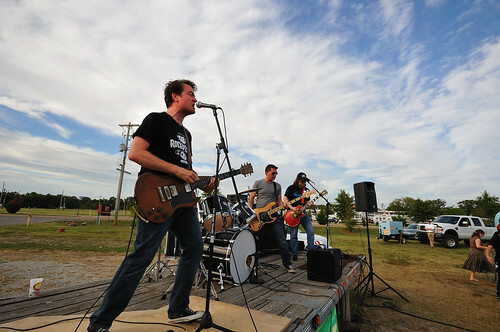 Our show was at the Mid-South Maze which I think we can all agree, totally rocks. (My only complaint is that it isn't in Midtown!) 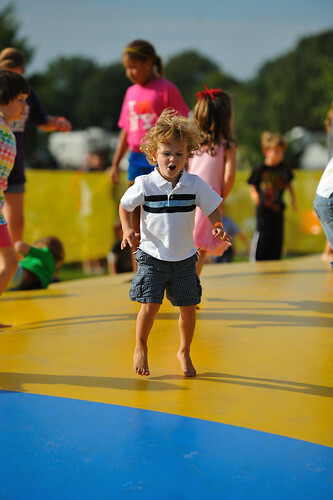 While everyone loves the maze itself, it is the jumping pillow that holds the rock-n-rompers attention. 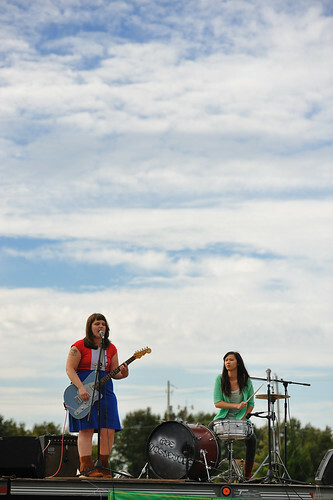 First up were the Vignettes-- a newish band composed of two totally rockin' women. 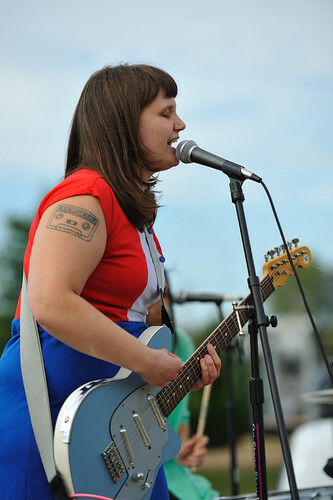 I loved them and was totally reminded of Sleater-Kinney. 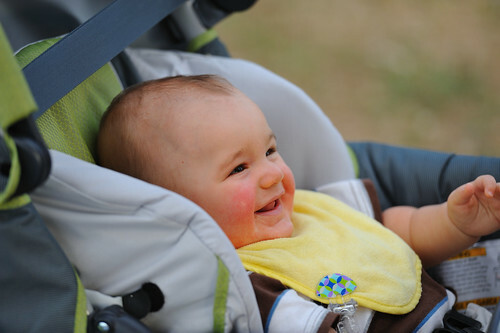 It didn't take them long to win over a hoard of new fans, with this cutie pie clearly sliding into #1 Fan status. While the Vignettes played, the non-dancing rompers descended upon the Grizzlies inflatables in droves. A few of us watched in disbelief, and then horror, and then relief as they slowly deflated with a pack of kids inside. No one was hurt, but a handful were shook up. (Another handful was shouting, "Do it again!") Seems there was an issue with overloading the generators. 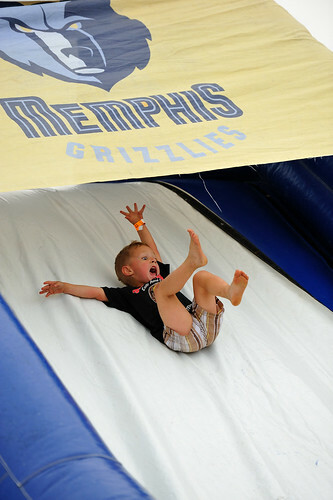 To solve it, the Grizz had to keep one permanently deflated, but the remaining slide still provided hours of fun. 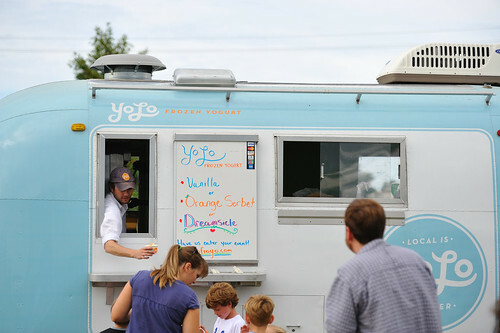 Speaking of generators, YoLo totally saved the day on Saturday. Not only did they give out free yogurt, they helped us power up the stage! Turns out our new, improved set up was a teeny tiny bit too far away from the Maze's power source. Had it not been for YoLo's generator, I don't think we could have handled having Pezz on stage! Despite the sound issues, they still completely and 100% rocked our faces off. It was really fun to see our emcee and hardworking board member, Marvin Stockwell, get to show us his rock star side. 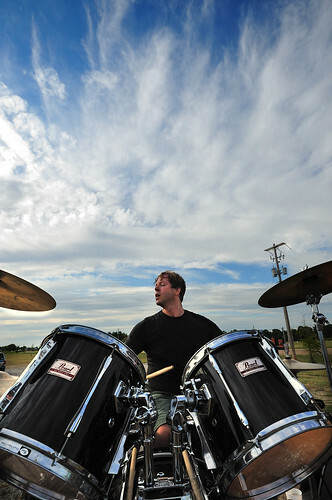 And check out RnR regular, Graham Burks, on drums! Pezz clearly had some fans in the crowd too! 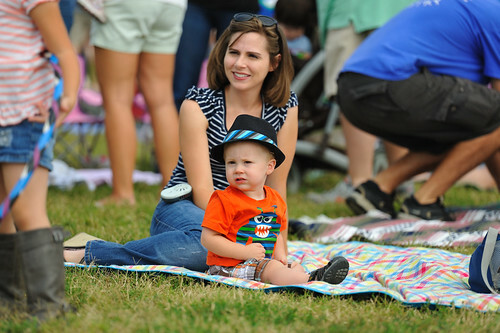 Also in case you missed it, all babies are now required to wear awesome hats to Rock-n-Romp. 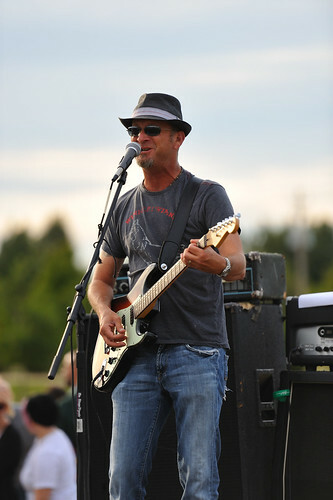 Speaking of hats, Chip Googe, of Punching Nicholas, put on his solo hat for Saturday's show after the band's lead singer suddenly lost his voice and was unable to play. We really appreciate him stepping up. 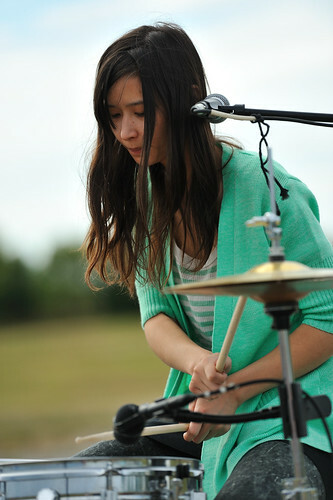 Despite the various hiccups that occurred during Saturday's show, I saw plenty of smiles. A HUGE thank you to our host, the Mid-South Maze, our generous sponsors--Central BBQ, YoLo, Whole Foods, and the Trolley Stop Market, our top notch volunteers, and our fun loving participants for a great afternoon! 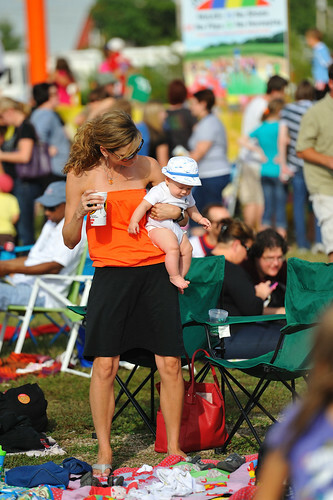 We hope to see you all at the Levitt Shell on November 5th from 2-5pm. The Wuvbirds, Arma Secreta, and the Rising Star Fife & Drum Band will be performing. 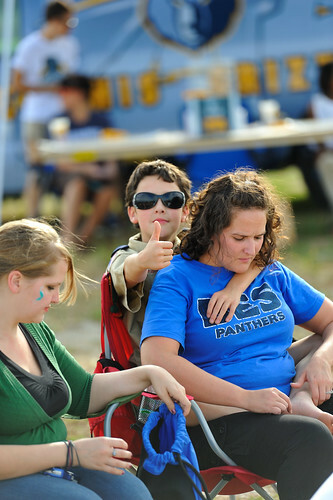 To view all of the pictures by Chip Chockley, our staff photographer, click here. Add yours to our Flickr pool here. 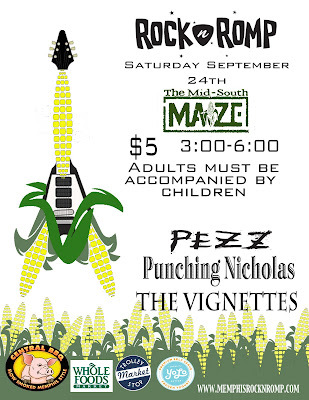 Come Rock-n-Romp with us at the Mid-South Maze on September 24th from 3-6pm. 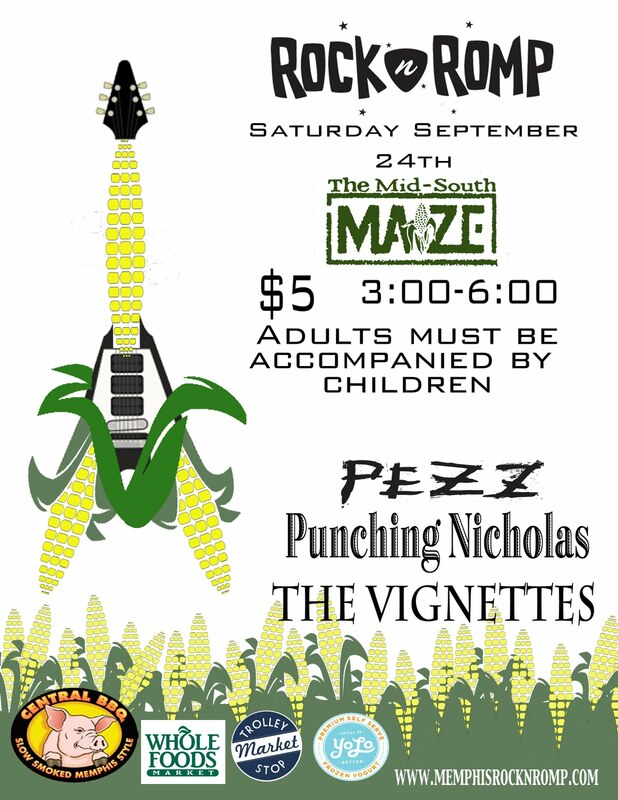 We'll have Pezz, Punching Nicholas, and the Vignettes playing. $5 Adults/kids free. Adults MUST be accompanied by children. 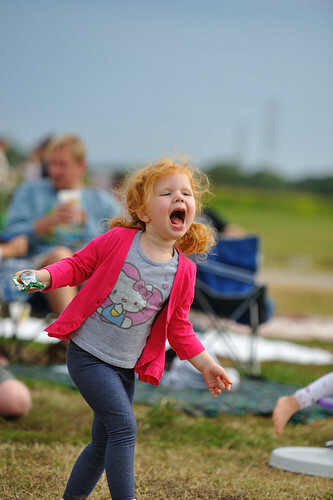 As always bring a blanket or a chair, a snack to share, and earplugs for the little ones. We look forward to seeing you!